Nine Inch Nails (commonly abbreviated as NIN) was formed in Cleveland, Ohio, circa 1988, and has so far released nine full-length studio albums, four EPs, seventeen singles, several remix collections, and some live material. Reznor's lyrics are largely concerned with the exploration of the self, but with albums such as Year Zero and The Slip, the lyrical focus shifted somewhat to extrospection. 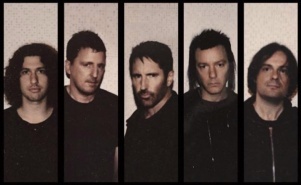 Earlier NIN material was created almost entirely by Reznor, but starting with The Fragile, he began to allow for a more collaborative writing process involving other players. The sonic ethos of NIN frequently juxtaposes electronic sounds with organic ones, and ugliness with beauty.